Chicago: some would say that the politics are corrupt. Others might claim that the people behind it are blatantly unrepentant devils. No, no not embezzlers or Blago-esque blunderers, but real, hellfire-forged demon-spawn cavorting around in borrowed human suits. Intriguing, yes? (And perhaps to some of my other Chicagoans in the house, just as we always suspected?) Well, Dark Horse’s Ghost, written by the illustrious Kelly Sue DeConnick and Chris Sebela, explores this fiendishly fun concept with a solid female protagonist to boot. Elisa Cameron is a woman of two worlds. She was human once, but it’s not like she fully remembers that foray of normalcy. All Elisa knows is that she exposed the mayor of Chicago for what he really was: a full-blooded demon who was summoning all his infernal friends with the help of a creepy, magical box. When Elisa ripped him from his body, he banished her to the pits of Hell until two unwitting paranormal investigators summoned her back to the human world. Now Elisa is Ghost, neither human nor demon, and toting a grudge. One by one, she picks off disguised demons until she can track down their reincarnated leader, now living in the vain and deadly body of Doctor October. Ghost brings home the bacon in a lot of respects. Elisa is, in every sense of the word, cool. She’s collected, capable, and calculating. Her powers are pretty inventive as well; she can dematerialize any part of her body at any point – i.e., she can literally reach into your chest and rip out your heart no problem. Or, luckily for humanity, she can leave normal folks alone and kill demons reversible-jacket style (….just think about that metaphor). Ghost doesn’t lack in its presentation. The intricacy of the plot and subplots are decently executed in addition to a well-written submersion into the hellish urban setting. Ryan Sook’s color choices and nightmarish dreamscapes hold up rather nicely. His artwork invites the reader into a well-written story of darkness, light, and the liminal spaces between. 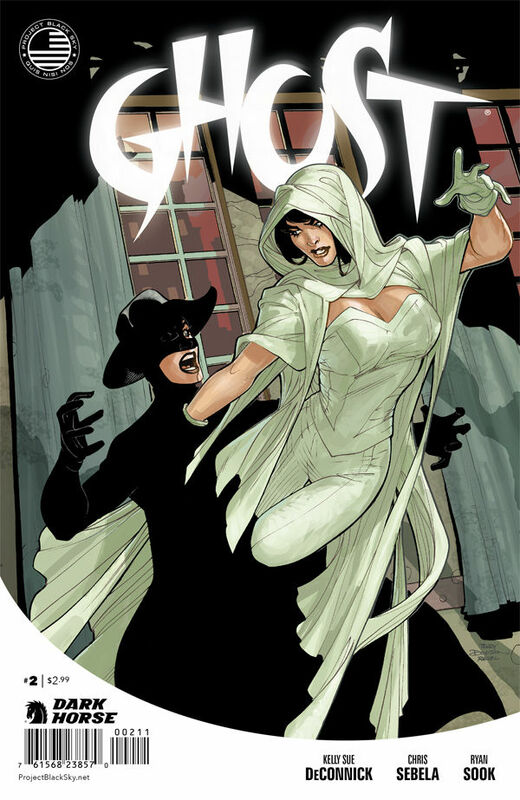 Overall, Ghost is a very promising, thrilling comic. I’m recommending it to all of my friends who desire a strong female superhero flavored with a little Specter, Spawn, and a pinch of Batman and the Monster Man. Fantastic review! I especially like the “she’s so aloof she could give Batman a run for his copious amounts of money” line. I’ve been looking for a lady-centric monthly comic to add to my pull list and it sounds like this one would be right up my alley.